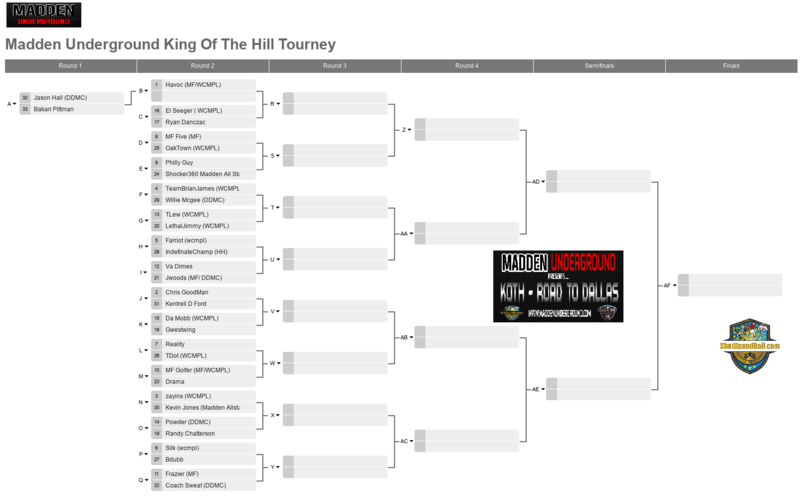 Winning King of The Hill looks like an extremely difficult task to Repeat for last years Champion Cris Havoc Brown. Havoc said ” I’m tuff and who ever wants the crown is going to have to earn it” .With Free Entry into the Shut up and Ball 10,000 dollar tourney and Cash Money on the line a lot of new and old faces have entered the picture. West Coast Legend Reality is daring to step into the Madden Underground Arena to steal the crown. Reality will be facing off with a hungry T.dot of the WCMPL Madden League a fairly new face to the Madden Community who is looking to make a name for himself, and what better way to do so by taking out a player of Reality’s caliber. Although Reality has been Deemed the heavy favorite in this match up based on experience alone don’t sleep on T.Dot. A few weeks ago Shocker 360 of the Madden All Stars promised that he or fellow Madden All star member Kevin Jones would win the whole thing. Shocker Will be Matched up with the Philadelphia native Philly Guy. The odd style of play Philly brings to the table often causes head aches for new opponents , which make this a very interesting match up. Shocker has been named the favorite in this match up based on the video’s he has been putting out as of late, the man has heat should be fun to see how they adjust to each others style of play. Chris Goodman goes by a couple different names these days , Va Assassin, King of VA, and now he is looking to add Madden Underground King Of The Hill to that list . The game has only been out for a week and he has already won a few tournaments in the DMV. Chris Will be locking in with Kentrell D Ford a worthy opponent who doesn’t plan on laying down. Chris is the favorite going into this game but that could change once the game kicks off. If you want to talk must see games it has to be J woods vs Va Dimes. Dimes is a very strategic player who creates solid game plans and schemes. Woods of the MF Crew has a few tricks up his sleeve he look to unveil. We feel Woods is the favorite to win the match up although a lot of other people feel Dimes could pull off the upset. Other Tourney Favorites to keep an eye on are Bronco, Five of MF , Ryan Danzcac, Bdubb, Kevin Jones of Madden All stars, and Zayins of the WCMPL. Who are your Favorites to win based on the Bracket above ? leave a comment below.